Last week’s Creaticity column revealed several superpowers of Apple’s free Preview app, such as removing an image’s background, and so on. In this second installment, you’ll discover Preview 8’s new annotation tools, how to add your signature to documents, password-protect files, and more! Peek inside the Tools > Annotate menu and you’ll spot several ways to draw attention to areas in a document or image. As with previous versions you can draw rectangles, ovals, lines, arrows, speech bubbles, and add text. You can additionally highlight, underline, or strike through existing text. 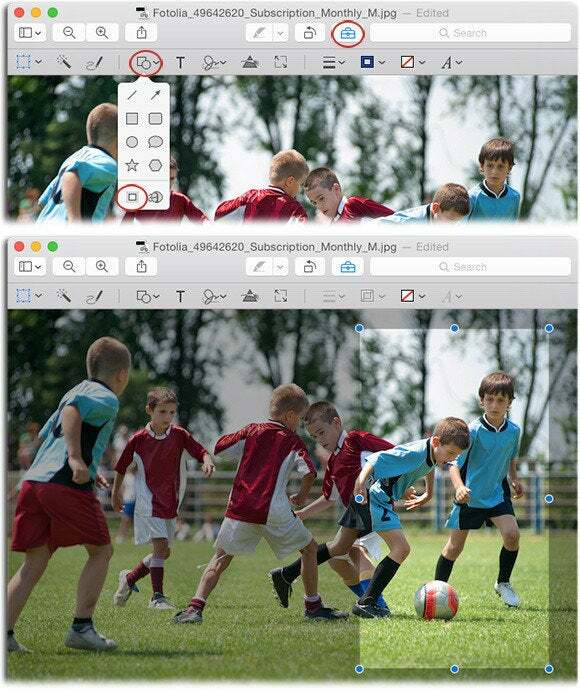 Preview 8 introduces five new annotation tools: Star, Polygon, Sketch, Mask and Loupe. Both the Star and Polygon tools are self-explanatory. Once you click on your document to add the shape, just drag the tiny, round green handle that appears in a circular motion to specify the shape’s number of sides (the Star tool sports a second green handle used to control side length). The Sketch tool lets you add freehand squiggles. If they resemble a shape, Preview auto-converts them (oval-shaped squiggles become ovals, for example). If you’d prefer to leave your original squiggle as is, you can revert to it using the floating toolbar that appears. Most exciting in the new annotation tool line-up are the Mask and Loupe tools. Each is accessible in the Tools > Annotate menu and in the Markup toolbar’s Shape menu. The Mask tool lets you highlight area(s) by adding a mask that darkens everything outside of it, which also makes for a slick photo effect. 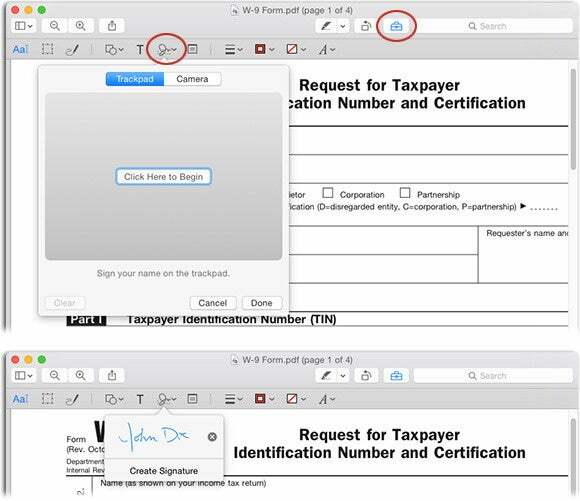 Once you activate the Mask tool (circled, top), it appears atop your document (bottom). Drag any corner handle to resize it or Option-drag to resize from the center outward. Click and drag outside the box to reposition the mask (your cursor turns into a tiny hand). The Loupe tool lets you magnify a certain spot with a resizable, stackable loupe. Once you add a loupe, you can increase or decrease its magnification level by dragging the round green handle that appears along its perimeter. You can also stack multiple loupe effects to magnify an area that’s already magnified. Activate the Loupe tool (circled, top) and a loupe appears over your document; just drag to reposition it. Dragging the blue circle alters magnification level and the green circle changes loupe size (bottom). Adding your signature to documents is far easier, too. Open the Markup toolbar by clicking the toolbox icon at the upper right, and then click the Signature tool (it looks like a tiny signature). Either draw your signature using your trackpad or mouse or use your Mac’s iSight camera to photograph a signature you’ve scribed onto white paper. Either way, Preview captures your signature with transparency, so you can gracefully plop it atop any document or image (say, for a quick watermark). You can capture a signature with your trackpad or iSight camera (top). Once your signature is captured, it appears as a menu item of the Sign tool for easy access (bottom). To slim the file size of any PDF (by reducing image quality), choose File > Export. In the resulting dialog box, choose PDF from the Format menu and then choose Reduce File Size from the Quartz Filter menu. Click Save and call it done. Preview can easily merge multiple files into a single PDF (say, to combine scanned documents or to combine a PDF with an image). To do it, open the first PDF or image, choose View > Thumbnails, and then drag other files—single or multiple pages of any dimensions—from the desktop onto the thumbnail sidebar. Drag thumbnails to reorder pages within your newly combined PDF and then save the file. To rotate a single page within a multi-page PDF (handy for scanned receipts), choose View > Thumbnails and then select the thumbnails of the pages you want to rotate. Next, click the Rotate button in the toolbar or choose Tools > Rotate Left or Tools > Rotate Right. If a page in your PDF has extra stuff around it—say, registration or crop marks—you can use the Rectangular Selection tool to crop it. Open the Markup toolbar, click the Rectangular Selection tool, and draw a selection around the area you want to keep. Next, choose Tools > Crop (or press Command-K to commit the crop). To crop multiple pages, choose View > Thumbnails and Command or Shift-click to select multiple thumbnails before committing the crop. To crop all pages, press Command-A to select them before committing the crop. To draw a more accurate selection for cropping, choose Tools > Show Inspector to open the Inspector window, click the Crop icon (it looks like an angled comb), and enter the location and size of the desired crop. To prevent a PDF or image from being opened, copied from, or printed, try password-protecting it. Open the file and choose File > Export, and in the resulting dialog box choose PDF from the Format menu. Next, enable the Encrypt checkbox, enter a password into the resulting field, and click Save. Be sure to rename or change the location of your newly protected PDF to keep from overwriting your original! Preview can extract several sizes of an application’s icon as images. First, select the application wherever it lives in the Finder (say, in your Applications or Downloads folder) and then press Command-C to copy it to your clipboard. Next, press Command-N to create a new document in Preview and all the sizes of the application’s icon instantly appear as individual pages with transparency. To save a specific size as a new file, select the appropriate thumbnail and choose File > Export. To preserve the icon’s transparent background, choose PNG or TIFF for the file format in the resulting dialog box. To extract an app’s icon, just select the app and press Command-C (top). When you create a new document in Preview, the icon instantly appears at multiple sizes with transparency (bottom). Preview can also show you how a document will print on a certain printer, which is useful for seeing how a color document will print on a black-and-white printer or how a vibrant image will look on a commercial press. Open the file and choose View > Soft Proof with Profile and in the dialog box that appears choose a standard profile such as Generic Gray, Generic CMYK, or a profile specific to your printer. As you can see, Preview is mighty powerful, though perhaps the most difficult thing is remembering to use it! Until next time, may the creative force be with you all. PhotoLesa.com founder Lesa Snider is the author of the best-selling Photoshop CC: The Missing Manual books, coauthor of iPhoto: The Missing Manual (link for both the Photoshop and iPhoto books: lesa.in/lesabooks), author of The Skinny Book ebook series (theskinnybooks.com), a founding creativeLIVE instructor (lesa.in/clvideos), and regular columnist for Photoshop User and Photo Elements Techniques magazines.